Ingela Ihrman | Jättenäckrosen blommar! The video is from the first blooming, June 8 and 9 2012, in a small municipal greenhouse in Kalmar, a middle sized city in Sweden where I lived until I was 19. 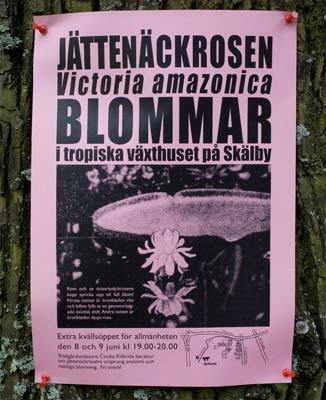 The gardener and teacher Cecilia Kilbride hosted the public event, realised in collaboration with Kalmar Konstmuseum / Art Line.